Major Stock Exchanges of World Name, Country, List: Stock exchange is a form of exchange which provides services for stock brokers and traders to trade stocks, bonds, and other securities. Securities traded on a stock exchange include shares issued by companies, unit trusts, derivatives, pooled investment products and bonds. BBC Global 30: World stock market index of 30 of the largest companies by stock market value in Europe, Asia and the Americas. iShares MSCI EAFE Index (EFA) - provides investment results generally equivalent to publicly traded securities in the European, Australasian and Far Eastern markets. Maintained by Morgan Stanley Capital International. MSCI World - free-float weighted equity index. Index includes stocks of all the developed markets. Common benchmark for world stock funds. S&P Global 1200 - global stocks index covering 31 countries and around 70 percent of global market capitalization. Dow Jones Indexes - leading global index provider. NASDAQ - broad market index of all of the common stocks and similar securities traded on the NASDAQ stock market. 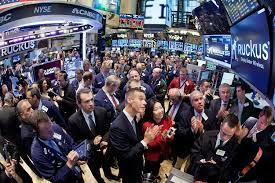 NYSE - covers all common stocks listed on the New York Stock Exchange. S&P 500 - stock market index containing the stocks of 500 Large-Cap corporations. Comprises over 70% of the total market cap of all stocks traded in the U.S. Owned by Standard & Poor's. Case 30 - index of the Cairo & Alexandria Stock Exchange; includes the top 30 companies in terms of liquidity and activity. SSE Composite - index of all listed stocks (A shares and B shares) at Shanghai Stock Exchange. Hang Seng Indexes - record daily changes of the largest companies of the Hong Kong stock market (represent about 67% of capitalization of the Hong Kong Stock Exchange). BSE SENSEX 30 - includes the 30 largest and most actively traded stocks on the Bombay Stock Exchange. Nifty - index for 50 large companies on the National Stock Exchange of India. Nikkei 225 - stock market index for the Tokyo Stock Exchange. KSE 100 - index acting as a benchmark to compare prices on the Karachi Stock Exchange. KOSPI - index of all common shares on the Korean Stock Exchanges. TSEC - capitalization-weighted index of all listed common shares traded on the Taiwan Stock Exchange. S&P/TSX Composite - index of the stock prices of the largest companies on Toronto Stock Exchange. Dow Jones Euro Stoxx 50 - free-float market capitalization-weighted index of 50 Eurozone stocks. Provides a blue-chip representation of Supersector leaders in the Eurozone. FTSEurofirst 300 Index - free-float capitalization-weighted price index. Measures the performance of Europe's largest 300 companies by market capitalization. Covers 70% of Europe's market cap. S&P Europe 350 - free float market cap weighted index. Covers at least 70% of European equity market capitalization. CAC 40 - contains 40 stocks selected among the top 100 market capitalisation and the most active stocks listed on Euronext Paris. DAX - measures the performance of the Prime Standard’s 30 largest German companies in terms of order book volume and market capitalization. MICEX Index - capital-weighted price index of the 30 major and most liquid Russian stocks traded at the Moscow Interbank Currency Exchange. RTS Index - index of 50 Russian stocks traded on the RTS Stock Exchange. FTSE 100 Index (Financial Times Stock Exchange Index) - capitalization-weighted index of the 100 most highly capitalized companies traded on the London Stock Exchange.